Known as Telford Trust Building, 261 George Street is an eight storey commercial office building over ground and basement retail which was originally constructed in 1939 to three levels and extended in 1962 to its current height with further refurbishment in recent years. The building features black terrazzo plinth and imposing curved fa硤e. The building occupies a corner location providing each commercial floor with excellent natural light to three sides and allows floors to easily subdivided into smaller regular shaped suites with good window coverage and lift exposure from the side mounted service core. The building has a superb ground floor entrance foyer and is serviced by two passenger lifts. Air conditioning is central plant with perimeter induction units. 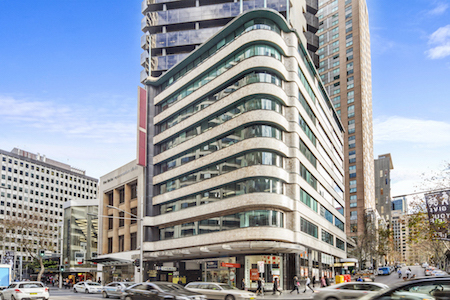 261 George Street is located on the corner of George and Jamsion Street in the premium north end of the CBD, which is close to Circular Quay and moments away from Wynyard station. The location is in the financial core of the CBD and is surrounded by Premium and Grade A office towers which includes Australia Square, Grosvenor Place, Met Centre, Suncorp & NAB Tower.